South Africa's Rik De Voest, above, beat American Amer Delic, second photo on the left, 7-6, 6-2, to win the Challenger event at Hollyburn Country Club, July 29 - August 6. American Ansley Cargill, top photo on the left, the winner of the last year event, beat Valerie Tetreault of St. Jean sur Richleau, Que., third photo, 7-5, 6-4, to win the Women's Single title. Five members of Canada-s Fed Cup team - Valerie Tetreault , Sharon Fichman, Melanie Gloria, Ekaterina Shulaeva and Heidi El Tabakh - were all entered in the tournament. Shulaeva lost in quarters and Fichman in semis to Cargill, on her way to the final. Gloria, the last year finalist, lost in the first round to No. 4 seed, Seiko Okamoto of Japan. 15-year-old Sharon Fichman of Toronto has improved much since last year as she lost in the first round of 2005 event..
17-year-old North Vancouver native, Philip Bester lost in the first round of main draw to American Phillip Simmonds, 7-5, 6-2. 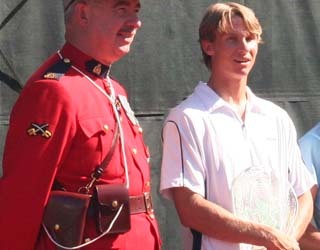 Bester reached the final of French Open juniors and won his first Davis Cup Match for Canada. None of top 5 BC tennis players - Graeme Kassutzki, Kamil Pajkowski, Rahim Esmail, Daniel Chu and Justin Kates - could be able to pass the Men's Singles qualifying section. On the Women's side, only Rebecca Marino of Vancouver, the winner of Stanly Park Open, could move to the second round where she lost to No. 2 seed, Ryoko Fuda of Japan, 6-2, 7-5. Third seed Yen-Hsun (TPE), fourth photo, the top ranked player of the last year event, lost in the semi-finals to Delic 6-2, 7-6. Photo 5: Rita Wan and Sam Gouneili watching the games. Rita played host to American Story Tweedie-Yates during the tournament. Thanks to many volunteers who provided housing for the players. Butorac, Eric (USA) / Parrot, Travis (USA) defeated De Voest, Rik (RSA) / Weiner, Glenn (USA) to win the Men's Double final and N. Kriz (AUS) / S. Tweedie-Yates (USA) Beat J. Magley (USA) / C. Nagle (USA) to win the Women's final. The prize money for the men's champion is $14,400 US and 75 ATP ranking points and for the women's winner it's $2,940 US and 25 WTA points..